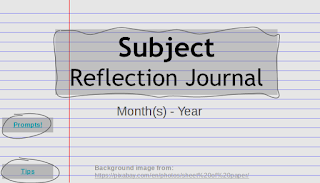 I'm happy to say my reflection journal guidebook is now available here to anyone who takes my reader survey. I'm also giving away two free copies of the print editing. 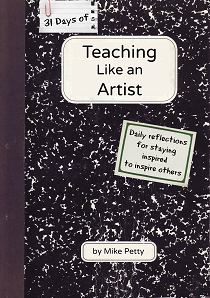 It's designed to help teachers "stay inspired to inspire others". Over the course of 31 days, the short activities and entries will raise thought provoking questions to get you started along The Way of the Artist. Each is meant to take about 10 - 15 minutes. They come from 22 years of my own experience as a teacher, with some based on the most powerful lessons I've shared with students and teachers. Find a deeper sense of purpose in your work. Get exciting ideas to recharge creativity in your classroom. Gain some practical experience in making and sharing amazing work. The journal is a Google Docs booklet so you can type your entries in it and easily access online resources that it refers to. I should have a print version available shortly, but you can get started with this flexible, portable digital version right away. Please visit this post to find out how to get your copy! This is (and probably always will be) a work in progress, but I want to share it now. It's completely usable as is, but I'm looking for feedback so I can expand the basic prompts and improve the video tutorials. One of my favorite aspects of teaching is giving students creative ways to reflect on what they've learned. I've found that good questions will engage them. We also know the time spent pondering the material in new ways or summarizing it can help cement all the pieces that are otherwise separate in the students' minds. Most importantly you can get a copy of the template there. The journal template itself starts as just a single slide in Google Slides. Students can rename it, title it and make it their own with images and all the other tools. If students are on a Chromebook or signed into Google Chrome, they'll be able to keep their journals for all classes or subjects on their Bookmark bar for easy access on any device. 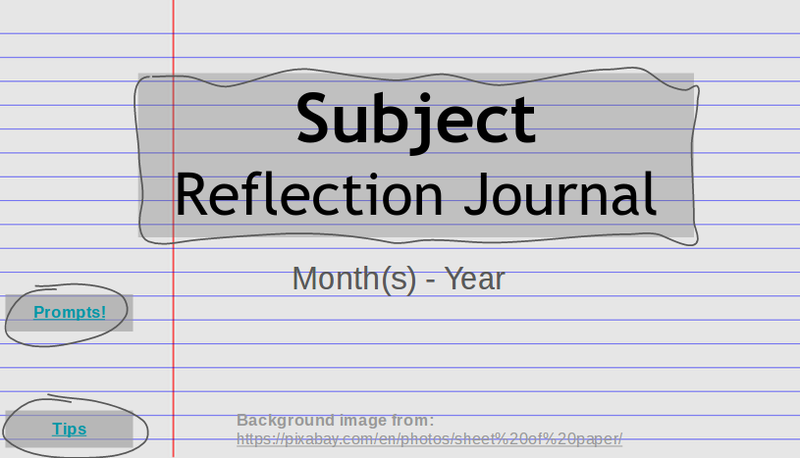 From that first "page" of the journal, you and the students can click a link to open this other Google Slides presentation made up of prompts. 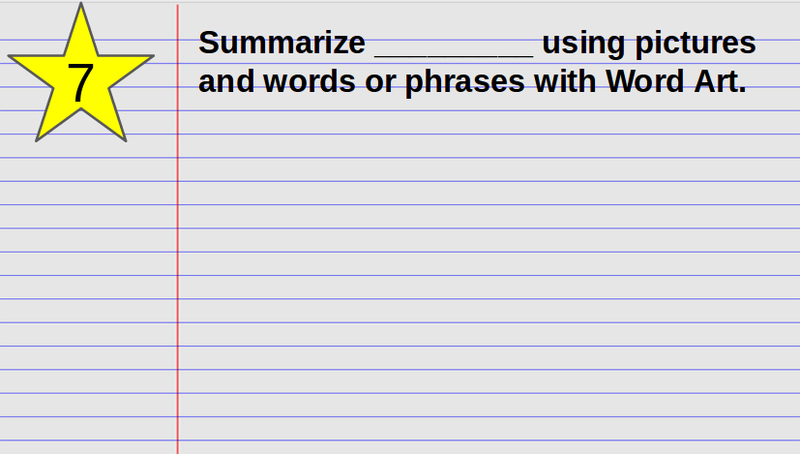 Students would copy the prompt slide that you ask them to use, then paste it into their journal. Here's one simple example. You would tell students what to put in the blank on the prompt, possibly the story you just read or the math skill they just learned. In this case, the students would respond with images and text. Sometimes they will require writing. 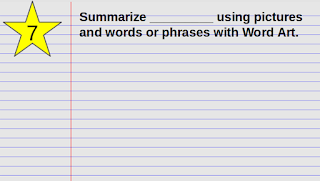 Of course, nothing is stopping you from just using your favorite prompts to make your own blank prompt page. The website has a page of video tutorials that can help you or the students learn the basics. One shows how to easily share the project to students using Google Classroom. A few tutorials are still "coming soon", but there is enough on the page to help you see the main idea. Please let me know if you have comments. As I mentioned, I have always found reflection to be an essential element of learning experiences. However, in way of inspiration, I'll point out that Larry Ferlazzo's recent interviews on reflection is what got me thinking of this project.